Our english speaking callcenter at FUNK TAXI BERLIN is at your service all hours of day and night. Don’t feel like calling? 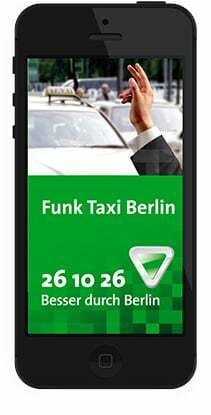 Simply order your taxi with our FUNK TAXI BERLIN App. There are only a few cities in which the taxi is so prominent in the cityscape as in Berlin. Whether it is day or night, whether Alexanderplatz or Kudamm, whether airport or at the main station – Berlin taxis are available everywhere and around the clock. Even when other means of transport break, they bring ten thousand passengers a day to the desired destination. Comfortable, safe and inexpensive. And the typical Berlin taxi driver is known and popular all over the world for its special charm. ON THE COURSE TO SUCCESS. For the past 80 years, we have been contributing to the fact that satisfied passengers are coming from people in a hurry. Our success story began in 1938 with a manageable number of vehicles and taxi call boxes in the city. Today, in the year 2017, we have long been one of the leading partners in the field of taxis. We see ourselves as a state-of-the-art service center for the transport of people, which is mastering its steadily growing tasks with innovative technologies and services. Modern ways of ordering a taxi – e.g. Per app or via the internet – are just as self-evident to us as payment systems by credit card. As a partner of our taxi companies, we are currently managing a fleet of almost 2,000 vehicles. This includes not only the extremely comfortable classic limousines, which every customer knows and appreciates. We also have about 400 large taxis for up to 6 passengers and around 100 other vehicles can even transport up to 8 people. Also special wishes are not a problem for us, for example the provision of child seats or the transport of people with disabilities. On behalf of the State of Berlin, we have special vehicles for the transport of electric wheelchairs. And if you wish, our drivers will not only get you there, but accompany you to the door. Also in terms of speed, the service of Funk Taxi Berlin is more than good. Over 80 trained employees in our call center ensure that your desired taxi is within a few minutes. Around the clock and 365 days a year. In peak times we are able to transfer more than 10,000 transports daily to our taxis thanks to the latest digital technologies. You don’t have to hop into the first taxi at the rank – in fact, you get to choose any one you want. At Berlin’s Tegel Airport, however, a special rule applies to the order in which taxis are stationed. Within Berlin and the municipality of Schönefeld, all taxis are under obligation to carry passengers. All journeys beyond this may be declined, but this is highly unlikely. Please ensure you’re clear as to the price of your journey before consenting to it. The customer is always right! The windows and sunroof are to be opened or closed, and the air conditioning switched on or off, according to passenger preferences. In terms of the radio, while the passenger may express a preference in relation to the volume and radio station, the taxi driver ultimately decides when to switch the radio on or off. Since 1st of September 2007, a smoking ban has been imposed on all taxis – this applies to the driver and the passenger(s) in equal measure. Taxi drivers are to carry an appropriate amount of change with them. However, high-value notes must be exchanged by the passenger themselves. As a passenger, you always have a right to a properly filled-out receipt. Hygiene comes first. The taxi is to look clean and well-maintained both inside and out, and the taxi driver is also to look well-groomed. The taxi driver is obliged to assist with loading and unloading luggage when passengers enter and exit their vehicle. As a taxi driver has been entrusted with conveying passengers, they are required to drive in an appropriate manner. Short on cash? Then order a Cabcharge taxi! Over 1,200 of our taxis accept credit or EC card payments, as well as customer cards. As a passenger, you determine the purpose, destination and route of your taxi ride. Unless you express a preference as to the route, your driver will take the shortest possible one. Fare transparency must be ensured: In each taxi is a sticker with a fare breakdown. This is displayed on the rear left side window. In the mandatory fare zone, it is not permitted to either exceed or fall below the set fares. Conveniently order your taxi at FUNK TAXI BERLIN online in just a few clicks – either as a guest or a registered user. You can also order a taxi at FUNK TAXI BERLIN at any time by email. Simply send us the details. We still know how to use good old paper, so you can also get in touch with FUNK TAXI BERLIN by fax. We will get back to you ASAP. Get someone you care about a practical and original present by giving them a voucher for a convenient taxi ride of their choice. We do need your phone number for an easy confirmation. Our easy-to-use taxi app doesn’t just work in and around Berlin, but anywhere in Europe where there’s a compatible taxi dispatch office. If the app is unable to locate a compatible office, it will give you the telephone number of the nearest taxi firm, so you never have to worry about reaching your destination.